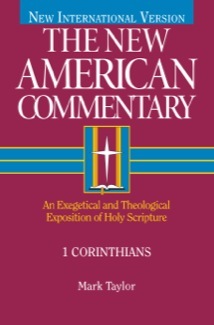 Though it apparently released in April, I just became aware that the latest volume in the New American Commentary Series has been published, 1 Corinthians by Mark Taylor of Southwestern Baptist Theological Seminary. I have ordered the book and I hope to do a review later in the summer. While I have found the quality of volumes in the NAC series a bit uneven, some of the volumes – like Garland on 2 Corinthians or Blomberg on Matthew – are outstanding, ones I recommend to students regularly. You can find an interview with Taylor re: his commentary here. More to come. Hi Matthew – thanks for bringing this to my attention. I have corrected the link.